I think this is such a cute way to display your veggie and dip tray. 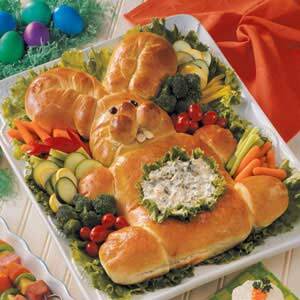 To make bunny bread you use frozen bread dough to form the bunny. Once the bread is baked and cooled, you add the dip. To see the full instructions on how to make bunny bread, check out the recipe on Taste of Home here.